Research from the A. James Clark School of Engineering was featured in DISCOVER Magazine's top 100 science stories of 2007. 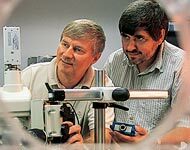 The magazine's January issue, which hit newsstands December 12, cited the University of Maryland research team of Christopher Davis, professor of electrical and computer engineering, and Research Scientist Igor Smolyaninov for their innovative superlens microscope technology. The team has developed a powerful superlens with concentric rings of acrylic glass on a gold film surface, using advanced applications of plasmon technology. The researchers use plasmons—electron waves generated when light strikes a metallic surface—to help reveal fine, nano-scale details that were previously undetectable. The lens can be used to see objects on the scale of small viruses. The research was published in the journal Science and Physical Review Letters, and has received attention from many science and technology publications. DISCOVER's top 100 science stories were intended to highlight scientific breakthroughs that have impacted everyday life. "We chose these 100 stories not only because of their news value but because they focus on breakthroughs that are changing the way we view the world," said Corey S. Powell, Executive Editor of DISCOVER Magazine. "This issue is an opportunity to reflect on the scientific advancements that made an impact on everyday life this past year, and which will undeniably have an impact going forward."